The 7 Sacraments are gifts and graces given to us by God. At Saint Brigid Parish we want to help engage you in a sacramental life between and beyond receiving a Sacrament for the first time. Our faith and our lives are richer when we celebrate the gifts we have. Whether you’re here to prepare to receive a sacrament or learn more about them, we want to give you a full and personal experience. Have you recently gotten engaged are are looking to get married at Saint Brigid Parish? Have you recently had a baby and are looking to get him or her baptized? Are you children growing up and you want them to receive the first communion, first confession or confirmation? Are you interested in becoming a priest? Are you or a love one seeking an anointing of the sick? 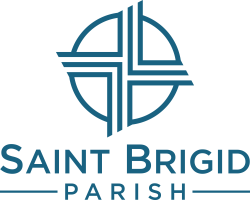 Have you lost a loved one and want to have their funeral at Saint Brigid Parish? Or are you interested in becoming Catholic? Whatever brings you here we welcome you.